We are a little obsessed with language in our home. Bob’s dad and grandmother were born in Germany. I’ve been ‘trying’ to speak Spanish since college. Our last name is very French and we have tried to incorporate some French in our lives since a visit to northern France a few years ago. Immersion for me has always been the key, but I do realize all children (…well, people) learn differently. I had to laugh the first time I heard Brooke say ‘manzana’ instead of apple. And she loves to say, “No more, por favor!” (And says it correctly) from one of her favorite books. It seems as if she does absorb through immersion and Bob was thrilled that I wanted to try the first of the TWELVE part series of the Early Lingo French DVD collection which starts with Colors and Shapes. 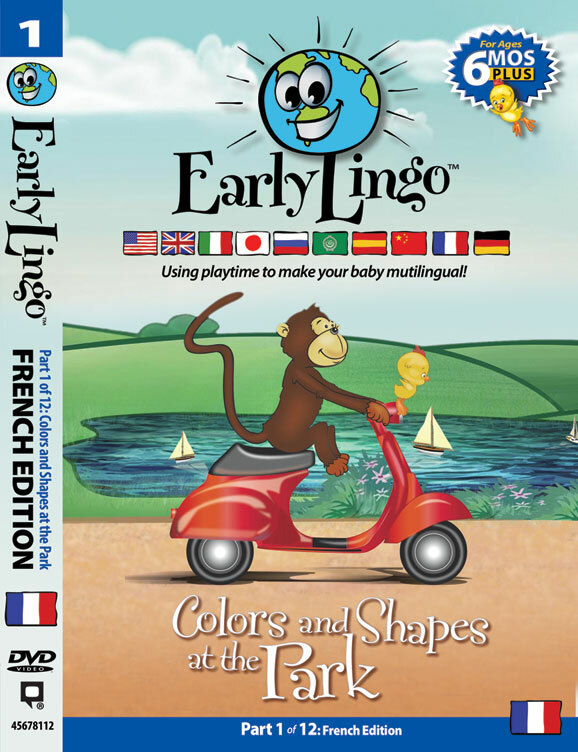 Early Lingo French DVD collection is a twelve part collection for a total immersion method. Parents or caregivers are encouraged to be part of the process and engage along with the child while watching the DVDs. Immersion is considered the most natural and effective way to learn a new language and children literally memorize words while watching and interacting with different languages. In part one you follow Jojo the monkey on his motorbike and his friend the girl Lulu as they have adventures in the park and learn many colors and shapes. There are so many different related vocabulary and expressions revealed in this one video but it is done in a fun and seamless manner. I am definitely looking forward to trying the next DVD for us to learn more. Great job! Check it out! The Early Lingo website has a fun recipe section for items to make and try from around the globe!